Finding frames that fit your face, your style and your budget isn't always so easy. It's tempting to just pick the first pair of frames that are barely acceptable than face the daunting task of sorting through hundreds of frames to find the perfect option. Luckily, there are a few tricks you can use to simplify the process. Although some people look good in any type of frames, most of us aren't so lucky. Narrowing down frame choices is easier when you understand which types of frames look best for these common face shapes. Round. Square frames help balance a round face, as long as they're not too small. Too-small frames, whether they're square or any other shape, can make your face look rounder. Square. Oval, round or rectangular frames with rounded edges soften a square face. Do you wish your face was a little longer? Select narrow frames to visually elongate your face. Heart. Round, oval and rimless frames are also a good choice if you have a heart-shaped face. Stay away from glasses that are thicker on top than the bottom. Diamond. Both oval and rimless styles are a good choice if your face is diamond-shaped. Cat-eye glasses or frames that contain decorative details can help provide balance. Oval. If your face is a perfect oval, you probably love shopping for frames. Nearly any type of frame looks good on an oval face. These days, glasses are available in almost any color. Unfortunately, that doesn't mean that those neon green specs will look good on you. When you choose a color, consider your eye and hair color and your complexion. Your complexion is probably cool if you have blue, gray or green eyes with silver, gray or strawberry blond hair, or black hair with a touch of blue. People with warm complexions often have brown or hazel eyes and blond, brown or black hair. Try on blue, purple, black or silver frames if you have a cool complexion and green, aqua, brown, tortoise or bronze if your complexion is warmer. The thickness of your frames, in addition to the shape and color, is another important consideration when you choose new glasses. Heavy frames can overwhelm delicate features, but can be the perfect choice if you want to draw attention to the upper part of your face. You'll also want to make sure that your frames are thick enough to accommodate your prescription lenses. 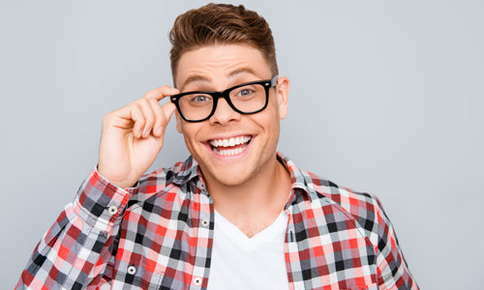 Although stronger prescriptions generally increase lens thickness, choosing ultra-thin lenses can help you ensure that you can wear the frames you love. What if you follow all the rules but don't like the frames that are supposed to be perfect for you? Frame selection guidelines can help you identify styles that will probably look good on you, but that doesn't mean that they'll work for everyone. It's more important to find frames that you'll enjoy wearing for the next year than to follow rules. Need a little help picking frames? Our staff can help you find a style that's just right for you. Buy one pair of glasses at regular price, get the second pair 50% off! **This offer is not valid for use with insurance.